Gravity Trails is Great Adventure in Door County! Gravity Trails has a lot to offer for those seeking unique things to do in Door County! With zip lining (this is huge fun) and now even "gem mining" for kids of all ages - where you can find up to 25 different kinds of gems and minerals as you sift through your soil in an 16 foot mining flume! And now paddleboarding and kayaking too! Zip Lining is a thrill for all! I have done this with my daughter and it is super fun! In 2013, Gravity Trails teamed up with Egg Harbor Fun Park in Egg Harbor for their zip lining operation. Zip Line Tour. You can take the Zip Line Tour, which incorporates climbing a rock wall then zip 4 times before reaching the ground. But wait - you finish up the tour with a tandem zip line racer - so this is a fun adventure. We recommend booking a slot for your tour early in your Door County trip to assure you will get your Zip Line Tour in - check their site for additional information about what to wear etc. You can also elect to do the Zip Line Racer separately and challenge a friend to race with you! This is also great fun - see our photo below. Again, you can book a slot on-line or call to reserve a spot, or just show up and race! NOTE: There is a age requirement of 8+ for zip line tours, as well as a weight requirement of minimum of 40 pounds and maximum of 225 pounds. 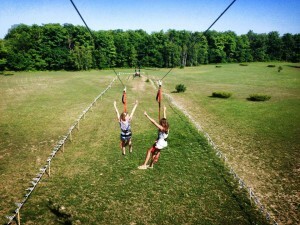 Again, the zip lining portion of Gravity Trails is located at Egg Harbor Fun Park, at 7340 Hwy 42 in Egg Harbor Wi. Rock Climing/Gem Mining. Also at the park, are the Gravity Trails Rock Climbing Wall and the Gem Mining for kids and adults! 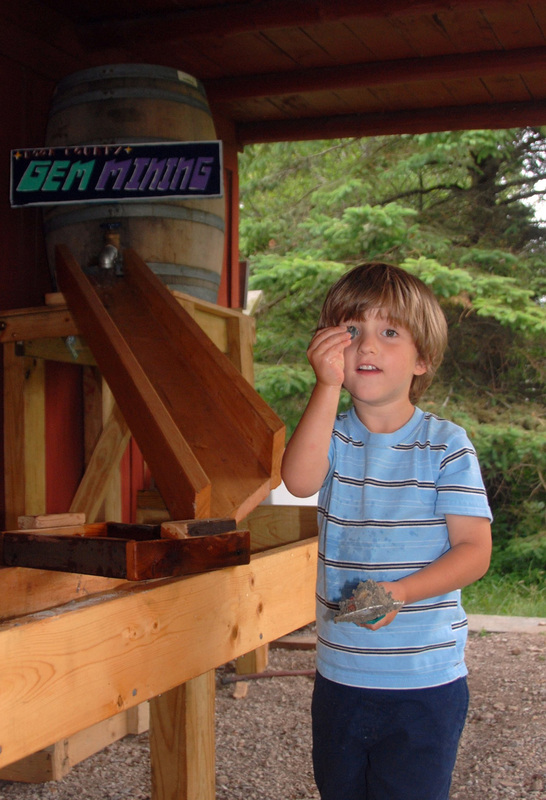 Gem Mining Tours are a kids favorite! There are about 25 different types of gems and minerals to find. “It’s real fun activity, especially for younger kids. Everyone loves rocks. They get to keep the rocks; and everyone goes home with a bag of gems,” Michael said. And Gem Mining is such a thrill for kids! I also did this with my daughter and we found a great gem! Gravity Trails has it all! 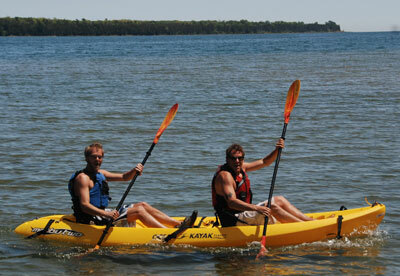 But if you prefer to get on the water, consider Gravity Trails kayak tours. And if you never sat in a kayak before that’s OK. Each kayak tour begins with a half-hour paddle lesson, followed by about two hours on the water. You’ll paddle near and around Cana Island Lighthosue in Baileys Harbor. So head to Gordon Lodge at 1420 Pine Dr. Baileys Harbor. Kayak Tours depart for the picturesque Cana Island Lighthouse, as well as explore, in clear bottom kayaks, the shipwrecks and wildlife - located in the protected and warm North Bay waters. Lasts about 2-3 hours. This is a very picturesque trip, and Cana Island Lighthouse is one of the most photographed features in Door County. Oh by the way, while you are on one of the Gravity Trails’ tours, you’ll learn a lot as well as have fun. “We are not just about activity, but we also mean to educate. We promote what we see and experience,” Michael explained. The tours are guided. Gravity Trails gets many first-time kayakers. “You go out with a skilled kayaker who puts you on the water,” said Michael of the guides, who are also knowledgeable of Door County nature and friendly. The guide kind of circles the participating kayakers who use single or double sit-on-top kayaks. Kayakers return to the launch spot. You can also do stand-up paddleboarding (very popular now) and head out on a shipwreck tour as well. Complete fun at Gravity Trails! So, if you are up to the “challenge,” give a Gravity Trails educational tour or gem mining experience a try. Check out there "combo packages" for groups and discounts. We KNOW you will love discovering Gravity Trails! So click through right now and make your plans to head to Gravity Trails! for some fun zip lining, kayak tours, paddleboarding and gem mining - and please tell Michael, Dave and the gang that DoorCountyNavigator.com sent you on this adventure!